I thought I would take a little time to review some of the courses that I attended with at Chris Tribe's workshop in Ilkley. I have been a woodworker since 2000 and it started out as a way to occupy some downtime when I wasn't writing software. I attended a basic skills course at a local college and pretty much never bothered with another lesson, I set my own workshop up and hacked at finding my own way to work and of course using the magazines and books. I bumped into Chris at the 2013 North of England Woodworking show and saw some absolutely beautiful work on display, I was more shocked when he told me his students had actually built them. I thought there is no way I would be able to build anything like this but a curved stool caught my eye. I asked Chris what course was the stool covered on and he mentioned it was the advanced laminating and veneering. I did think that this was way beyond my skill set but hopefully one day. I gave it some thought and looking through his list he had a basic skills 1 to 3 that covered sharpening and preparation of tools, planing and M & T joints and finally Dovetailing. I thought it would be nice to go over the basics and plug any holes I had in my skill set (and there were a few gaping ones). It wanted to make sure I had a good foundations to build on so in November 2014 I started my first course. I remember hand cutting a really sloppy Mortice and Tenon (most of mine up to that point were machined) and I said to Chris, well its not a million miles away and he looked at me and said, so David, it doesn't fit then! I think the penny dropped at this point that nearly just wasn't good enough, it is perfect or it isn't. I realised if I had any hope of making that curved stool I needed to raise my game and make things as perfectly as possible. The first three courses were excellent, they covered the basics in enough detail to send you home with a set of razor sharp chisels and a lovely set of dovetail bookends. The courses were perfectly paced over three weekends and we managed to finish everything on time. I took a bit of a left turn and did the modern cabinet making course as I was planning to build some fitted wardrobes and If time permitted my own kitchen (a new born baby has put the latter option off the table) and then the finishing course which I did with my wife who absolutely loved it. The modern cabinet making course was really excellent, I learned an awful lot about the preparation of panel products and the use of a spindle moulder. It was doubly helpful as I had bought a Felder combination and I wasn't too sure about the spindle side of things. However the course covered setup and safe use of the machine so it was a bonus to me. The only problem was that I now really really wanted a Domino to help me make the cabinets (another toy to smuggle into the workshop). The finishing course covered the uses of french polish (nicely demystified by Chris), Danish oils and water based finishes, also the preparation of a surface before finish is applied. Finishing was always an afterthought for me but this course really gave me a good grounding on what is a vital element of making a piece. After I had come home and practiced my newly improved skill set, I booked onto the advanced laminating and veneering course. This was entirely new territory for me, I had never done anything like this. It was a week long course just like the modern cabinet making and I imagined we would need every hour. I was on the course with two lovely gentleman from North Yorkshire who I had the pleasure of having lunch with everyday. Up until that time I had never seen anyone eat a sandwich with a knife and fork but this was a week of firsts for me. We started out by making the formers for the top and the legs. Selecting veneers for the table and cutting these as a quarter or a half to get visually pleasing results. We covered flattening and preparing the surface for glue. Once that had been done, we started looking at jig making for cutting angles (most important). We proceeded to then glue up the top and legs covering the choice of correct glues for the job and use of the vacuum press. Once the forms had cured we could start machining them with the jigs and getting them lipped. We then moved onto the use of inlay to dress the area where the veneer met solid, this was done in ebony stringing and was the most delicate part of the process. I actually used a card scraper for the first time and its now a really invaluable part of my toolkit. We finished the piece off by scraping the whole thing level and eased the edges. The final element was to glue it all together and give it a finish. I managed to get mine done at the workshop but a few others who had fallen behind finished theirs off at home. I remember standing back and looking at it as a complete piece thinking I have actually made this! I never thought I would have the skill set or actually the patience but once it is broken down into its constituent parts, its a small set of logical steps that have to be completed (perfectly ). I think something needs to be said about the scheduling of the course once you are there. You are paying a premium for Chris' time and experience and he expects you to crack on a keep up the pace. You leave at the end of the week physically tired as you have been working flat out to learn and make, but the sense of pride is immense that you have crafted something so lovely, you soon forget how much you ache. However, its very manageable and I am the proof of that pudding. Chris himself is a very nice and approachable guy. He has a great sense of humour, although a little dry (the north has rubbed off on him) but I don't share his taste in music. I think radio 3 and nothing beyond 1975 are on his playlist, but oddly enough it matched the work we were doing. The workshop is very well equipped and is an old mill building which has its own old world charm. I must admit I really looked forward to getting in there very early and cracking on, it was a shame when it was over as the whole experience was extremely enjoyable. I also met some really lovely people on the course. Completed project without a finish applied, I still look at it with a degree of awe! 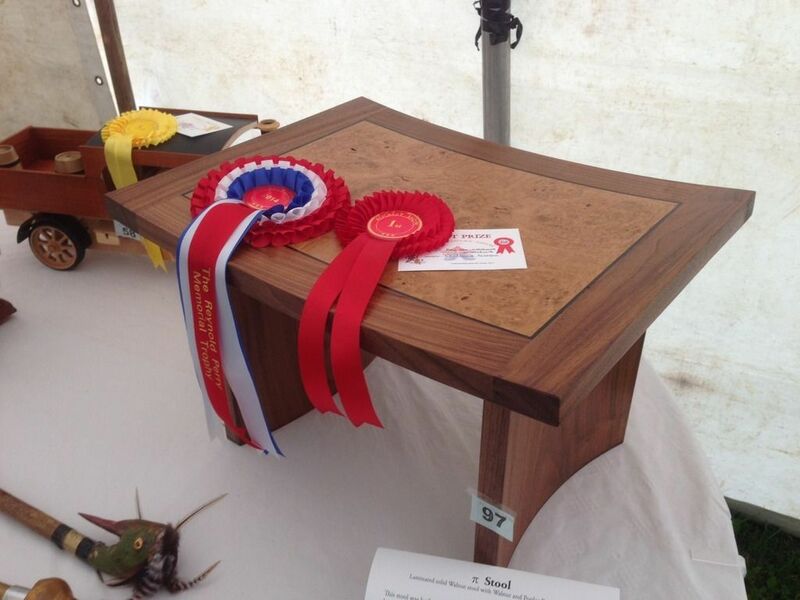 I entered the stool into a local exhibition and won first prize!!! What next, well good question. I have just renovated the whole house over the last 6 months to get ready for our first baby so nothing for the time but I have had my eye on making my own sliding table and chairs. I was thinking about booking some special tuition and making the table over a few months but Chris' new chair making course looks like an amazing challenge and there is his piston fit draw making course which I really would love to do. So that's another two weeks spoken for. What a beautiful stool, you must be very proud. I met Chris at the Yorkshire show and he was extremely approachable and knowledgeable. Thank you for taking the time to give a "review" of the courses, it is always helpful to have this sort of information. +1 From me too, an excellent read! As I am a newcomer to woodworking this was a great post and has made me think very seriously about what courses I need to be taking. He is a great bloke and for me the acid test is if my wife takes to someone, she is a policewoman and doesn't really like anyone (Apart from me) and she thought he was lovely - so there! I have been meaning to review his courses for some time as he is a proper gentleman and deserves a pat on the back from me for his patience and putting up with my terrible jokes and innuendo. I also have a great deal of respect and envy for his talent and skills, plus he is seriously down to earth chap. There is no man crush going on by the way. I am also incredibly proud of the piece I have made and the confidence it gives you to push the limits. Its David btw (Not Andy). I've seen Chris Tribe's courses advertised and often wondered why other training workshops don't offer similar "modular" or "project based" packages. I know from my time in the USA that these type of short courses are very common and popular over there as they allow someone in full time employment to build up their training in bite sized pieces. Peter Sefton does a few, David Charleworth runs his short sharpening programmes, there's the odd one at West Dean, and there's more specialist training such as James Murcell's Windsor Workshop. But, by and large, paid for training in the UK is based around the 9-12 months "accelerated apprenticeship" route. If you've got the time and funds then nothing beats it, but the majority of keen hobbyist woodworkers aren't likely to be able to make that commitment. So it's good to hear such positive feedback for Chris's course, more power to his elbow (and yours!). Last edited by custard on 29 Apr 2015, 06:35, edited 1 time in total. I've seen Chris Tribe's courses advertised and often wondered why other training workshops don't offer similar "modular" or "project based" packages. I know from my time in the USA that these type of short courses are very common and popular over there as they allow someone in full time employment to build up their training in bite sized pieces. Peter Sefton does a few, David Charleworth runs his short sharpening programmes, there's the odd one at West Dean, and there's more specialist training such as James Muriel's Windsor Workshop. I did look at Peter Seftons courses but they were an hours drive further for me, I couldn't commute (doncaster based so just up the A1 and along a bit) and I think the furniture Chris makes is better so it was a no brainer for me. I do wonder why more makers don't do short courses for hobbyist. I don't want to commit to a full time course as I have no intention of doing this for a living and project based courses are so much better. In fact I have been on Chris website tonight and looking in detail at his chair courses and that is split over 4 weekends which is perfect for work as I don't have to book time off. Which begs the question, why hasn't anyone else thought of that???? That's an interesting question, and I think the answer says a lot about the reality of cabinet making today. Most paid for training courses exist simply because it's so very very difficult to earn a living as an independent furniture maker. They're a means to an end, a way the craftsman can make some extra money while still pursuing their primary objective of creating great furniture. The ideal student from the furniture makers perspective is someone who is really committed and will sign up for a decent period of time, so that the student is able to spend longer and longer at the bench without constant supervision. It wouldn't surprise me if we moved to a situation where there are a small number of centres for serious, vocational cabinet making (apprenticeships for the 21st century if you like) together with a number of other centres that are more geared towards meeting the needs of the hobbyist. And in a competitive educational market it's clear from your experience that project based training would be a big draw. Thanks David for the review and the kind words. I didn't realise your stool was winning prizes! I ran the veneering and laminating course a couple of weeks ago. This time we did it without the curved top, just curving the legs. This made it a little less pressured and also allowed us to do an additional cross banding and inlay exercise. The stools looked good, but that curved top really does make them something special. I may offer the curved top an optional extra. 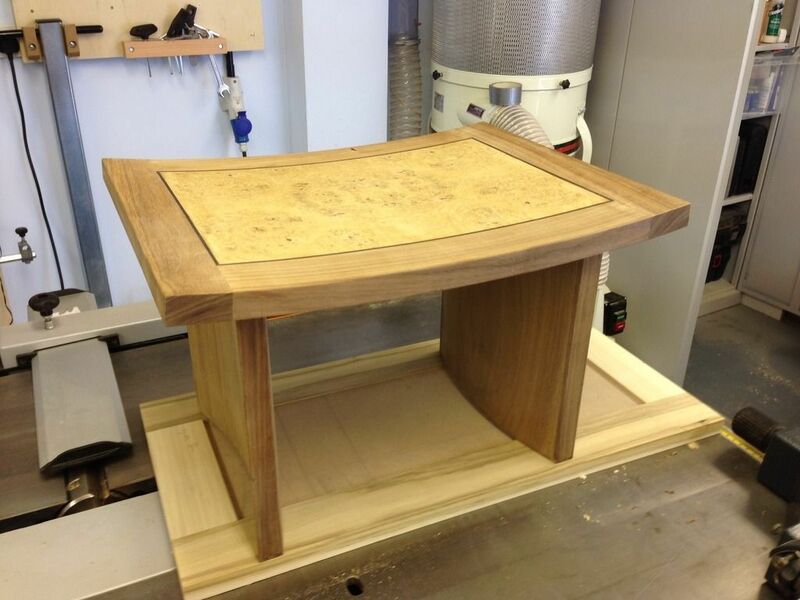 It's good when students attend a series of courses as you did as I can see their woodworking skills develop. I have a couple of students who started with very basic courses and now come for special tuition where they are doing quite challenging work, one comes for a weeks summer holiday each year! Interesting comment Custard. I certainly started teaching as a supplement to my making income. One of the reasons I do not offer professional courses is that I feel uncomfortable training someone for a career were it is so difficult to make a living. Although the courses started off as a supplement they have rather taken over. Making a piece of furniture can take a while and you have to build up and impetus and get in the zone, having to break off to prepare for and teach a course tends to destroy this a little, which is why my making is rather taking a back seat. I suspect this is the case for most one man teaching workshops, only the larger shops with a separate dedicated trainer can do both. Mr T wrote: Thanks David for the review and the kind words. I didn't realise your stool was winning prizes! Sorry, I forgot to mention it, I have to give the cup back this year as I haven't made anything to show - I don't think a picture of a fitted kitchen would work with the judges though? The top was a real labour of love and its stunning but I do agree we were under the pump to the very end and the flat top will make life a lot easier. I too attended one of Chris's courses in August 2014 where I became the proud owner of an oak hall table. The course was hard work but enjoyable and Chris would take the extra time to discuss and explain the processes involved which have re-kindled my enthusiasm since leaving teaching woodwork back in the early 1980's. Since the course I've made a garden bench, a radiator cover, a bookcase for a neighbour and I'm now in the process of making a 2nd garden bench for another neighbour ....its all such a change from the office and sedentary work/lifestyle I had been too happy to follow. I have done a few of Chris's courses and now own a superb bench, my wife has a nice two drawer jewelry box and I know a bit more about hand cutting dovetails. All this after he makes sure you can sharpen tools and use all the big machines safely. you want to improve your woodworking. Chronosoft wrote: Its David btw (Not Andy). My apologies, I don't quite know what happened there.